This DisplayPort to DVI Cable allows for quick and easy integration of a DisplayPort Device (PC, Laptop) with a DVI equipped monitor or TV. DisplayPort defines a new royalty-free, digital audio/video interconnect, intended to be used primarily between a computer and its display monitor, or a computer and a home-theater system. While standard DisplayPort cables are able to pass video as well as audio, this cable is only capable of passing video. Why, you ask? 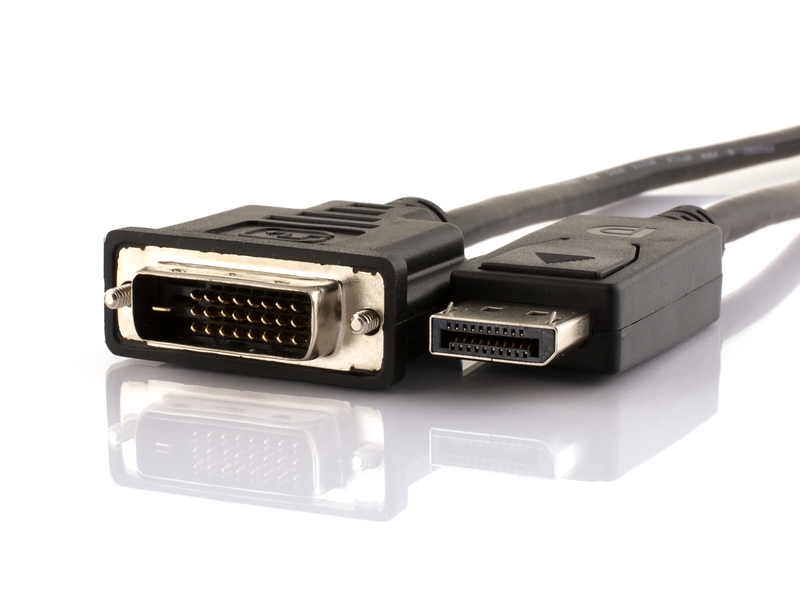 The standards that define DisplayPort and DVI/HDMI use different technologies for transmitting data which makes them incompatible with each other. If they are incompatible then how am I receiving video? Well, the source device is able to detect which connection is on the other end of the cable and simply sends a DVI signal instead of the DisplayPort signal. Thank you! Works great I use it on a 4 monitor setup. I ordered 3 of these to satisfy my graphics card supporting 5 monitors. The fact they were 10 ft long also was a huge appeal, because I could duplicate a few displays a distance away from my computer to have multiple access for viewing. The quality and durability seem very good and performance, my monitors work very well. I'm so glad I found these here. Works great, packaged nicely. If you need a display port to dvi this is it. These cables were better than expected and were a better price than any local stores. Delivery was faster than expected. This is a high quality 10 foot Display Port male to DVI male computer video cable. Very well shielded, yet not too bulky. Perfect for hooking up multiple late model low cost computer LCD screens (DVI end) to single and/or SLI High-end graphics cards (DP port). The price and quick delivery options make this the best buy on the internet for this type of cable.